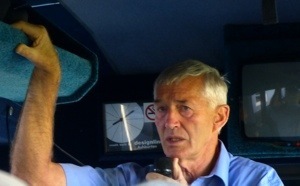 A long drive is a pleasure when you have Albert and Chas on board. Their commentaries are educational AND entertaining. Have I mentioned that the Kiwi sense of humor is quite delightful? The bus is very comfortable and quite spacious. We were grateful to have our skillful driver Andrea behind the wheel, navigating the winding single lane highways and byways to Rotorua. 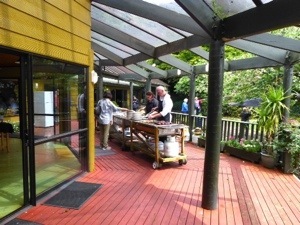 But first we stopped at Roselands for terrific barbecue lunch. This is definitely NOT a weight loss trip! 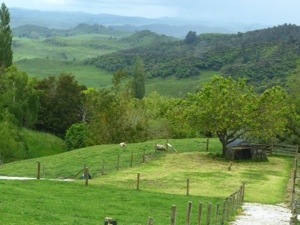 The view from Roselands was typical New Zealand: green rolling hills, with sheep grazing on the hillside. 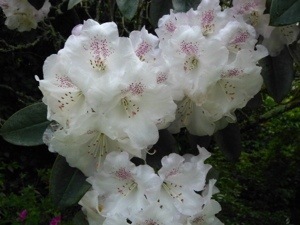 The rhododendron were in bloom and were spectacular. 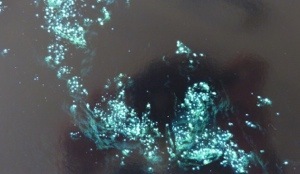 Our next stop was the Waitomo Caves, the home of the awe inspiring glow worms. Here’s what happens. You walk with a guide through caves with interesting stalagmites and stalactites. All very nice, but I had seen similar versions in both the US and Halong Bay. Then we entered a boat, and floated into pitch darkness and complete silence to witness a breathtaking phenomenon. We weren’t allowed to take photos, but postcards are a good alternative. So, this will give you a very rough idea of what it was like. My new friend Mel (and yes, we have bonded already, so whether he likes it or not, he has become a friend for life) wrote this beautiful poem that sums up the experience better than I ever could. It was definitely a peak experience, and one that I will never forget.